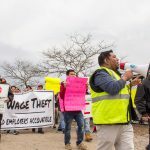 Earlier this month activists and workers rallied in front of the 145 Front St. development in Worcester to celebrate a $15,000 settlement in a wrongful termination case between subcontractor, P&B Partitions and carpenter Eddie Vasquez who says he was fired by the company after joining forces with the New England Regional Council of Carpenters on a case involving wage theft. Although P&B Partitions never admitted guilt during the settlement proceedings, they did make a statement recognizing the right of carpenters at the site to unionize without being afraid of penalties or job loss. You can read more about this recent victory for the New England Regional Council of Carpenters here and here.